The children turned in at what was once the Old Mountain Road running to the left (south) off Snickersville Turnpike just past Clayton Hall Road, walked up the old right of way, and crossed the wooden bridge. When asked a few minutes later, "Now, why did people put mud and stones between the logs in the first place?" --they first answered, like good students, what they had just learned--that the stones and mud help strengthen the wall. Then, when pressed, one of the smallest ones piped up--"Oh--to keep it warm inside in the wintertime." The biggest hit of the day for the children, however, was probably meeting Justin's gentle border collie named Madison. The chidren lined up to take turns peeking into the door to see the interior of the Academy with its cathedral ceiling, restored stone fireplace, and short loft. They also bunched up at the back gate to look over at the Lodge and learn about the new Boulder Crest Retreat adjacent to the Academy, with its cabins for short stays by the families of wounded military and veterans. On the return walk, the group stopped to get ice cream cones from the nearby Bluemont General Store. The young visitors attend My First Camp at Bluemont, which is a summer program of the Bluemont Community Center. The Snickersville Academy still remains a construction zone, so visits are by appointment only. 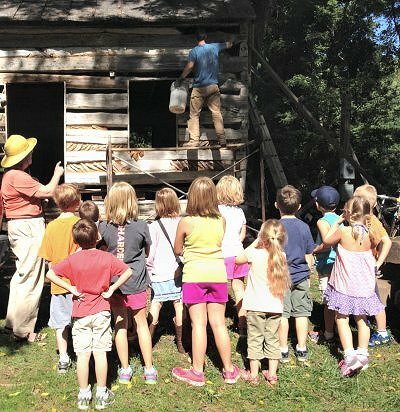 Friends of Bluemont's goal, however, is to establish a Snickersville Academy Park on the site, where visitors can learn more about the earliest years of the village. 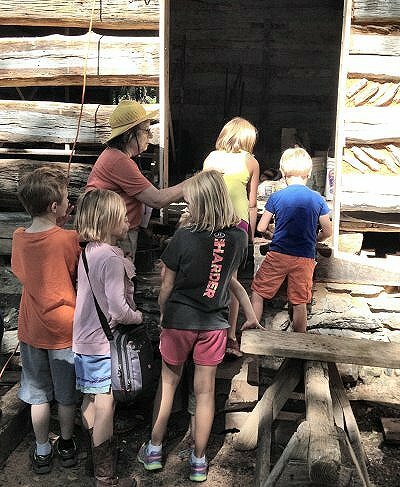 On Sunday afternoon, join in with thegrandchildren of Susie Neal as they share memories of living in the "Old Schoolhouse"as children during the 1960s. For more about the Snickersville Academy go to Facebook and "LIKE? Friends of Bluemont.